I read somewhere that daily meditation can make you 10 per cent happier. So starting about a month ago, for 20 minutes each day, I sit on a folded towel on my bedroom floor and breathe. I crack open the window to let in some fresh air and any night sounds – rain, wind, sometimes the neighbour’s chickens. All of it a pretty magical playlist for trying to get inside your own head and calm things down. I assume the recommended position of sitting cross-legged on the floor, eyes closed, hands resting on my knees or cupped in my lap. 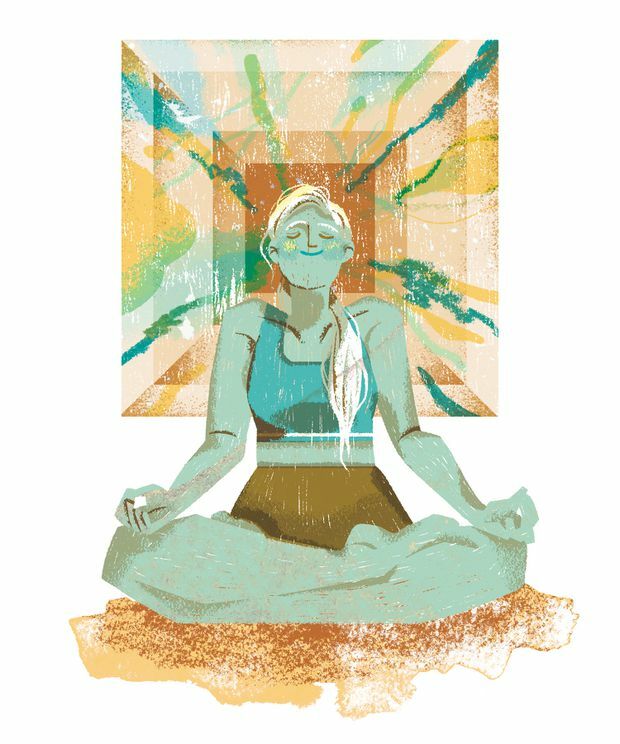 I’m not too precious about all the postural rules around meditation, just sitting on the floor and breathing for 20 minutes is a pretty big leap, so everything else is optional in my opinion. Then I start breathing and counting. Sounds easy I know, but trust me here, it’s not. My yoga teachers refer to “watching your breath” during meditation. One of those maddening, obtuse Zen statements that are really not super helpful. So instead of watching, I count. Ninety breaths takes just about 20 minutes. Deep abdominal breaths, in and out slowly, pausing for a few beats at the top of each inhale and again for a few beats at the bottom of each exhale. While this is going on, my body rebels, whining and complaining about the hard floor, my stiff hips, my sore back, my itchy nose. My mind starts to scurry and scrabble, like a trapped rodent in a cage, desperate to think of anything other than breathing. Sitting still and just being? Not happening. I need to return a phone call, make a shopping list, put in some laundry, clean the basement. The list is endless and relentless and, I’ve realized, will only really stop when I’m dead, or when I figure out how to meditate. So, the trick is to keep counting and breathing and gently (becoming angry or irritated with yourself is not effective) bring your mind back to the breathing you’re doing. After a month of daily practice, I can just about maintain full attention to three consecutive breaths at a time before my mind sprints off to whether the freezer needs defrosting or if I need to buy cat food tomorrow. A rhythm is starting to emerge though, during the course of the 90 breaths. The first 10 are actually not too awful, a bit like sitting back after a long day and enjoying some peace and quiet. No news cycle, no Netflix, no one talking. But then I get to breath 12 and suddenly my back is sore and I desperately want to shift position. Between breaths 10 and 30, my body and mind start protesting, “What! We’re doing this again?” moving quickly to convince me it’s futile. “What exactly is the point of all this?” I’m restless, mind drifting, and 90 seems impossible and hopeless. I deliberately slow things down, just to spite my body and my mind, making each breath extra long. That’ll show ‘em. By breath 30, I’m a third of the way there and now the real heavy lifting starts. The stretch between breaths 30 and 50 is a brutal slog through despair at my paltry efforts and willing myself not to quit. Exactly why am I doing this again? Breathe and count and stop asking so many questions. Sometimes, I just roll with it and watch my mind thinking all its random thoughts, doing pretty much anything else rather than focus on breath 43. Then there is that magic stretch between breaths 50 and 70, like I’ve climbed the hardest stretch of the mountain and can see the summit. Body and mind are finally quiet and focusing on each breath is not so impossible anymore. And I start to notice the silence in between all the sounds around me. And this is the weird, cool, “didn’t see it coming” dimension of meditation I’m struggling to figure out. The quality of this in-between silence feels way different than when I first sat down. It feels, and I know how out there this sounds, it feels deep and endless and profound. For at least a few breaths, it seems as if there might be something bigger, more cosmic going on, and I’ve tapped into it. So this might be what all the fuss is about. Has all this sitting and breathing and counting made a difference? Definitely, maybe, would be my Zen answer. Pretty sure I’m not reacting quite so mindlessly when a driver cuts me off, the grocery check-out line is too slow or that second telemarketer phones during dinner. I think I’m a little better at rolling with these minor hiccups, at stepping back, catching my breath and realizing that it is not about me, any of it. The driver, the grocery store clerk and the telemarketer are all out there living their lives too, and any irritation I might be feeling in the moment is likely nothing compared to the trials and tribulations in their lives. Perspective might be the hidden gem of meditation. Am I 10 per cent happier? Definitely, no question. Maybe not when I’m actually meditating, but throughout the rest of my day, for sure. And I recently read that if you can count to 100 breaths and back down again while meditating you will have attained the self discipline and focus to accomplish anything you want in life. I might just give this a try. Linda Jones lives in Chelsea, Que.